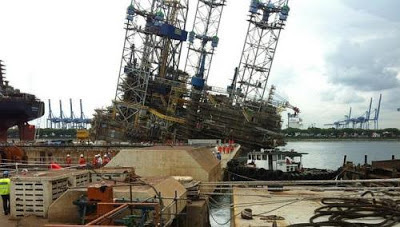 Singapore: About 90 workers were injured when a jackup rig at Jurong Shipyard tilted to one side on Monday. Among them, 22 were seriously injured and one is still in a critical condition. The rest suffered minor injuries. The accident happened at Jurong Shipyard Pte Ltd worksite at Tanjong Kling Road. Preliminary findings showed that the three-legged jackup rig tilted to one side after the jack-up mechanism of one of the legs failed to work, said a spokesman for the Ministry of Manpower (MOM).